I collected a few dozen goldenrod galls last March to see what comes out of them. I have a handful of Eurosta solidaginis emerging on time with the growth of goldenrod. But what I was hoping to find is some of the parasites. Surprisingly, these ones are not the Euritoma parasites but something else. They are also considerably smaller than Eurosta. Could they be hyperparasites of Euritoma? I just added a slightly better close up of the tiny one. Maybe it can be IDed to subfamily, too. It is certainly different from the others. Could it be a male Eurytoma gigantea? They are about the same size. Update: It has been IDed as Eulophidae. Regarding the two images in the top portion of this image, the black and orange coloration and short spines on the tibia indicate the subfamily Doryctinae. They are not hyperparasitoids. The bottom image may be a chalcid hyperparasite, but it's difficult to tell from only this inverted angle. At least two braconid subfamilies (Mesostoinae and Doryctinae) form galls on plants. 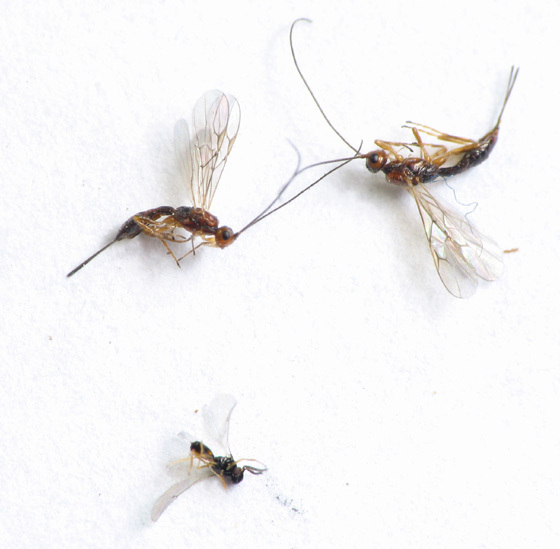 They are mainly external primary parasitoids of beetle larvae, and about 75 genera exist, but so little is known about this group that other hosts (including flies) are certainly possible. Nice work and discoveries Beatriz.